Heartworm disease is a serious and potentially fatal condition caused by parasitic worms living in the arteries of the lungs and heart of dogs, cats and other species of mammals. Dogs and cats of any age or breed are susceptible to infection. Heartworm disease has been reported in all 50 states. Heartworm is transmitted by mosquitos, and it takes only one bite to get infected! 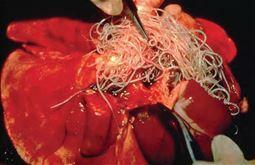 First, adult female heartworms release their young, called microfilariae, into an animal's bloodstream. Then, mosquitoes become infected with microfilariae while taking a blood meal from the infected animal. During the next 10 to 14 days, the microfilariae mature to the infective larval stage within the mosquito. After that, the mosquito bites another dog, cat or other susceptible animals, and the infective larvae enter through the bite wound. It then takes a little over 6 months for the infective larvae to mature into adult worms. In dogs, the worms may live for up to 7 years. Microfilariae cannot mature into adult heartworms without first passing through a mosquito. Recently infected dogs may exhibit no signs of the disease, while heavily infected dogs may eventually show clinical signs, including a mild, persistent cough, reluctance to move or exercise, fatigue after only moderate exercise, reduced appetite, and weight loss. There are a variety of options for preventing heartworm infection in both dogs and cats, monthly tablets and chewables, monthly topicals and a six-month injectable product available only for dogs. 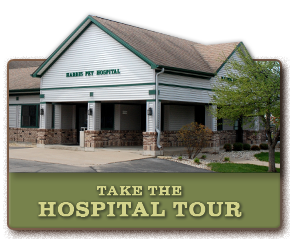 All of these methods are extremely effective, and when administered properly on a timely schedule, heartworm infection can be completely prevented. These medications interrupt heartworm development before adult worms reach the lungs and cause disease. It is your responsibility to faithfully maintain the prevention program you have selected in consultation with your veterinarian. 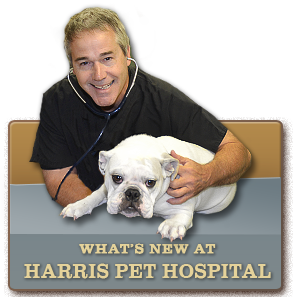 Usually, all but the most advanced cases of heartworm disease can be successfully treated in dogs. 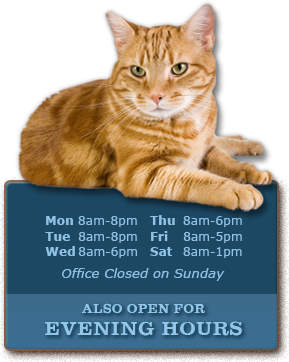 Currently, there are no products in the United States approved for the treatment of heartworm infection in cats. Cats have proven to be more resistant hosts to heartworm than dogs, and often appear to be able to rid themselves of infection spontaneously. Unfortunately, many cats tend to react severely to the dead worms as they are being cleared by the body, and this can result in a shock reaction, a life-threatening situation. Veterinarians will often attempt to treat an infected cat with supportive therapy measures to minimize this reaction; however, it is always best to prevent the disease. Adult heartworms in dogs are killed using a drug called an adulticide that is injected into the muscle through a series of treatments. Treatment may be administered on an outpatient basis, but hospitalization is usually recommended. When the dog is sent home, exercise should be limited to leash walking for the duration of the recovery period, which can last from one to two months. This decreases the risk of partial or complete blockage of blood flow through the lungs by dead worms. Re-infection during treatment is prevented by administration of a heartworm preventive. These preventives may also eliminate microfilariae if they are present. Dogs in heart failure and those with caval syndrome require special attention.